Screen shot Coyote Moon, Inc.
Apple has been fine-tuning how the scroll bars in OS X work. Starting with OS X Lion, Apple changed how scrollbars are displayed in any window that has a need for scrolling. This is different from the issue of natural vs. unnatural scrolling, which is Apple's way of saying which way a window's contents move when you scroll. The issue of scroll bars not appearing, or only appearing if you're in the process of scrolling a user interface mistake on Apple's part. Apple may have gone a little too far in its zeal to bring all things iOS to the Mac OS. While adding the option to allow scrollbars to behave like those in iOS is fine, the mistake was to set the scrollbars to work like iOS as the default. iOS and Mac devices have much in common, but one thing that is very different is the amount of screen real estate that is available to an app. Keeping scrollbars hidden in iOS apps makes sense as it allows an app to make the best use of the display size. But, on a Mac, it doesn't make a lot of sense to try and economize on-screen real estate, when in comparison there is so much space available. Seemingly, the primary reason to remove the scrollbar is that it is more aesthetically appealing. Although, it could possibly be because of the excessive amount of room that it occupies; in the limited display environment that iOS devices live in, that may be a good idea. But, on the Mac OS, it seems a little silly. By removing scroll bars, Apple removes a key visual benefit, which is the ability to know where you are in a document at all times. Scrollbars instantly show you your current position, as well what direction you may wish to move in to view the remaining document or go back to the beginning. Without scrollbars, it's a crapshoot. Are you near the end? Near the beginning? Have you read the whole article, or is there more hidden below the window? Or maybe there's more to the right or left of the window. OS X’s default behavior seems to be to display scrollbars if and when you start scrolling. So, in order to find out whether you need to scroll or not, you have to scroll to find out where you are. Fortunately, you don't have to live with OS X’s scrollbar defaults; you can change them to meet your needs or preferences. Since OS X Lion, the scroll bar visibility settings have been part of the General preference pane; before Lion, these controls were found in the Appearance Preference pane. 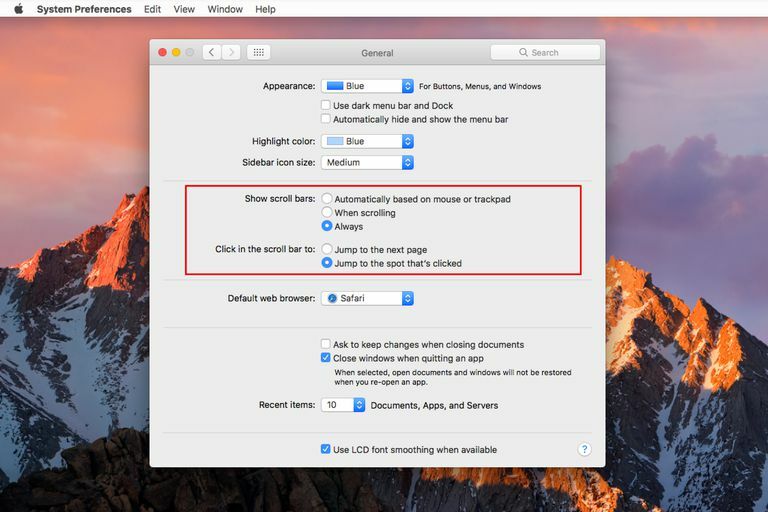 The actual options and their wording have changed slightly with each iteration of OS X, but the instructions below should be close enough to work for anyone who wants to adjust their scroll bar preferences. Launch System Preferences, either from the Dock or from the Apple menu (by clicking on the Apple Logo in the top left of the screen). If you're new to the Mac, you can also launch System Preferences from the Launchpad by clicking the Launchpad icon in the Dock, and then clicking the System Preferences icon. When the System Preferences window opens, select the General preference pane. The middle section of the General preference pane controls when scrollbars appear and what happens when you click on a scrollbar. To return the scroll bars to their pre-Lion functionality, and turn their visibility back on, select Always from the Show Scroll Bars options. The scroll bars will now always be visible, even when you're not scrolling. If you would rather have the scrollbars only show up when you actually start scrolling, select When Scrolling. If you would rather have the scroll bars appear when the cursor is in the area of a scroll bar, or when you start scrolling, select Automatically based on mouse or trackpad. Jump to the next page will move the contents of the window a page at a time, either up or down, depending on where you click on the scrollbar. Jump to the spot that’s clicked lets you fly to a point within the window's contents based on where you clicked in the scrollbar. If you click near the bottom, you'll go to the end of the document. If you click near the top, you'll go to the top of the window. And if you click somewhere in-between, you'll be moved to a spot in the document that matches up to where you clicked.